This week (week 3) our focus is on the barriers to a good education. Obviously a lot has been done with the passing of Brown v. Board case, but as we can see in Portland, one of the whitest major cities in the county, our treatment of students of different races has not improved much beyond desegregation. I can’t help but wonder if there is a socioeconomic prejudice to blame. Is the spending of $2.5 million dollars on training (called Courageous Conversations) the best way to eradicate this problem? “According to data provided to WW by the school district, the overall number of students being disciplined has fallen in the past three years, but the inequities between white and black have grown worse. Today, African-American students in Portland schools are nearly five times more likely to be expelled or suspended than whites. 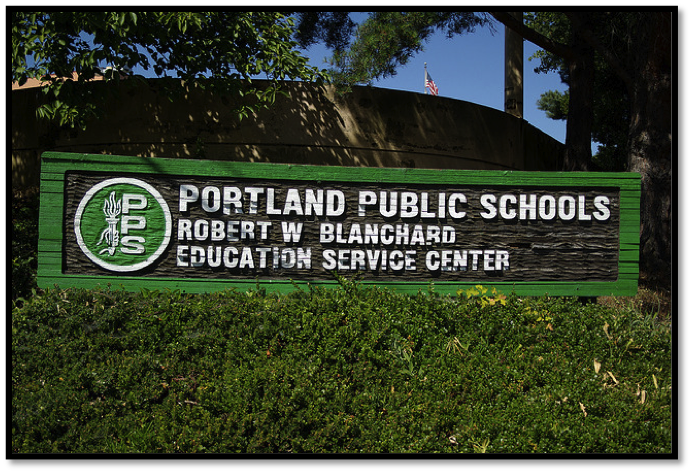 It’s a record that puts Portland’s unequal treatment of black students well above the national average and far worse than districts under federal investigation for civil rights violations. My biggest concern is that this money is being wasted on staff training, when really there is a deeper seeded issue here: the relationship between staff and students can’t possibly be a positive one with such racial inequity, and MANY studies have been done on the effects of overzealous disciplinary action in regards to graduation rates. How can we hold PPS more accountable when it comes to demonstrating a connection between resources and outcomes? Please read the entire Willamette Weekly article in order to respond effectively. The civic engagement activities that I have engaged in, as a result of my senior capstone class, Enhancing Youth Literacy, have exposed me to the tremendous need that is prevalent in our local Portland-area communities. I believe that this exposure and experience has enhanced my Civic Identity and Commitment. These experiences have clarified my sense of civic identity and reinforced my commitment to public action. I now see it as a personal duty to volunteer my time, when it is available, and my strengths, when they can be utilized, to better my local community. There are many different needs prevalent in our community, and a variety of ways that one can give back. Finding out what your interests are in and where you can make a difference is simpler than it may seem. Hands-On: Greater Portland is a great website that lists many diverse volunteer opportunities in the Portland Metro area. One can conduct an “Advanced Search” to seek out a certain time-frame that one has available to volunteer or a certain subject that one is most interested in, there are even opportunities to volunteer with your children. Today, I am wearing red to show my support for teachers at Garfield High School in Seattle, WA. Read here for more details on the MAP standardized test boycott. 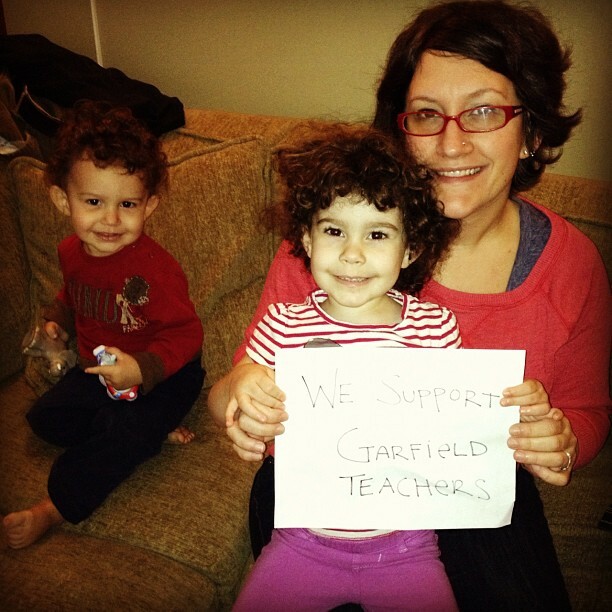 While I can’t drive up to Seattle with my two little ones in tow and I won’t be able to make it to the Portland Student Union’s meeting on opting out from Portland’s own standardized tests, (it’s right at baby bed time), I do want to spread the information about what’s happening at Garfield and to show my solidarity. I am a teacher. I am a parent. I am the daughter of a teacher. I am the wife of a teacher. I trust teachers to make decisions that are good for students. I want my children to have teachers who advocate for their best learning opportunities. I happen to be in a bit of an ebb when it comes to being physically present at a lot of community meetings and rallies. My children are 3 and almost 2. I teach full time +. 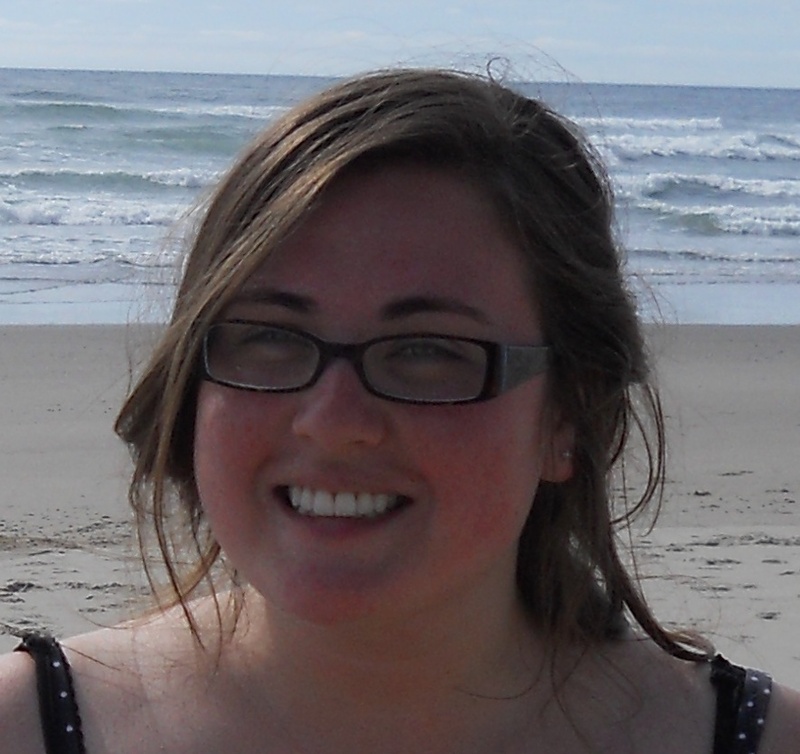 I work as a service learning coordinator at Rock Creek. 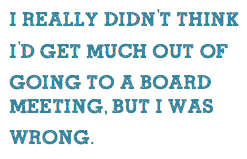 I volunteer to be part of committees that talk about how to get students more socially engaged. I am at my limit. Luckily, in this age of social media, I can still show up. I sign petitions; I share information; I talk to my kids about social activism; I wear red in solidarity. And in a few years, once the littles sleep through the night , I will be back out there doing what it takes to make my voice even more present. This is a small life lesson. There are many ways of “showing up.” Even if we have barriers or are busy, we can still find ways to show up. There’s no one right way to be an advocate or to seek social change. The only bad decision you can make is to do nothing at all. Note 2: Do a little pre-reading about the recent report on PPS high school graduation rates. 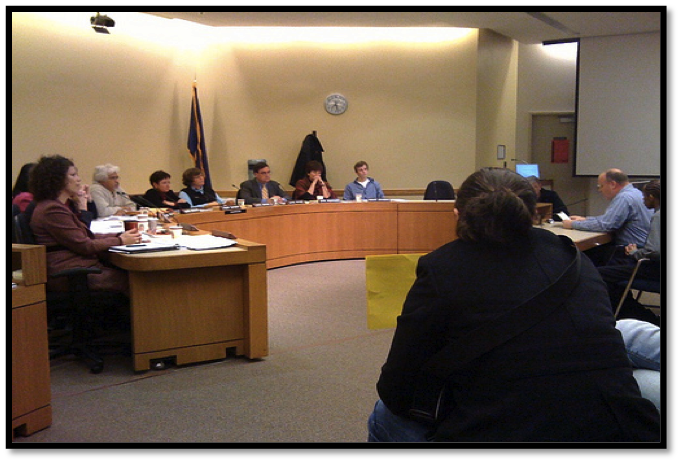 For my Independent Act of Civic Engagement I went to a PPS school board meeting. It was on Monday January 28 from 6 to 9:30pm. First they introduced everyone on the board and then went right into it. After the student testimony and student representative’s report they went into the first reading which talked about uninsured/underinsured motorist insurance coverage and personal injury protection coverage policy. Then the board went on to capital bond overview, the compact report. Next, they talked about the budget for this school year as well as the Jefferson PK-8 Enrollment Balancing Discussion. This was particularly interesting. They talked about the graduation rates and which schools need to be focused on to get the rates back up. 20 percent of all adult Oregonians have earned at least a high school diploma, an extended or modified high school diploma, or the equivalent of a high school diploma as their highest level of educational attainment. 2. 9th Grade Credits Earned: previously the PPS “10th Grade on Track to Graduate” milestone. As the Connected by 25 research demonstrated, students who were able to earn a quarter of their grades by the time they entered 10th grade were more likely to graduate. This important metric has been a key milestone focus for the last four years. This committee recommends that we continue emphasizing this important target with a 5% point increase and 5% point narrowing of the achievement/opportunity gap. Then they talked about the recommendations for achievement compact targets. They talked about college and readiness outcomes, about the 3rd grade reading proficiency and that their goal for 2015 is to have 100% of all third graders reading to learn. They also mentioned 5th and 8th grade math proficiency and the methods to go about helping to decrease the students who aren’t proficient. After attending the school board meeting I was really excited and enthusiastic about the changes and predictions that were being talked about. I felt like, as a past student, that a lot of the ideas they were coming up with were on track. They didn’t talk about budgets in this meeting but I wish they had because I always have an opinion on that. 🙂 However, I always feel a little apprehensive when it comes to “goals” set out by the school board. Goals are always a good idea at the start but things always seem to fall by the wayside… especially when it comes to graduation rates. That is a very hard thing to manage and it isn’t always a problem with attending school/many absences. A lot of times there are problems at home, etc. I don’t want to be negative, but I wouldn’t want people to get over-excited for something that doesn’t happen.